Alex Carrillo and Deanna Regali ventured up to Yarrawonga for a couple of days and managed plenty of fishing on land and boat. The guys managed to catch many Silver Perch, a few Trout Cod, Golden Perch and roughly 10 Cod. 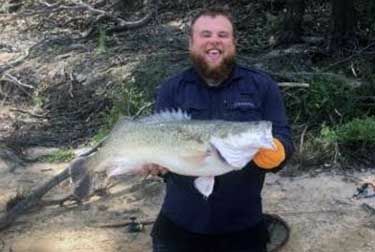 The prized catches however were a beautiful 57cm Golden Perch and a Magnificent Murray Cod just shy of a meter long. Catches done using a variety of Code lures and bait. Well done guys that outstanding fishing. Thanks for sharing your report with FishingMad.